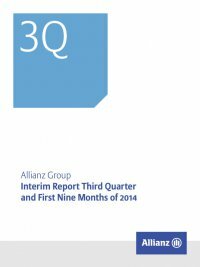 Interim Report Third Quarter and First Nine Months of 2014 Allianz Group12 Property-Casualty Insurance Operations Third quarter 2014 −− Gross premiums written reached € 11.3 BN. −− Operating profit grew 15.2 % to € 1,422 MN, mainly due to a benign natural catastrophe environment. −− Combined ratio at 93.5 %. Business segment overview Our Property-Casualty business offers a wide range of products and services for both private and corporate ­clients. Our offer- ings cover many insurance classes such as motor, accident/­ disability, property and general liability. We conduct business worldwide in more than ­50 countries. We are also a global leader in travel insurance, assistance services and credit insur- ance. We distribute our products via a broad network of agents, brokers, banks and other strategic partners, as well as through direct channels. Key figures key figures property-casualty € mn three months ended 30 September 2014 2013 Gross premiums written 11,254 10,650 Operating profit 1,422 1,235 Net income 1,083 796 Loss ratio in % 65.9 67.2 Expense ratio in % 27.6 27.6 Combined ratio in % 93.5 94.8 Gross premiums written1 2014 to 2013 third quarter comparison On a nominal basis, we recorded gross premiums written of € 11,254 MN, up € 603 MN – or 5.7 % – compared to the third quarter of 2013. Negative foreign currency translation effects amounted to only € 24 MN, largely due to the depreciation of the Argentine Peso and the Turkish Lira against the Euro, which more than offset the positive effects from the British Pound.2 Consolidation/deconsolidation effects were positive at € 123 MN, mainly because of the acquisition of specific distribution activities of Unipol effective at the beginning of the third quarter of 2014. Additional positive effects are expected from the purchase of an in-force portfolio as of the fourth quarter 2014. On an internal basis, our gross premiums written increased by 4.7 % due to a favorable volume effect of 4.0 % and a positive price effect of 0.8 %. We recorded strong growth at AGCS, in the United Kingdom and Germany. 1 We comment on the development of our gross premiums written on an internal basis; meaning adjusted for foreign currency translation and (de-)consolidation effects in order to provide more comparable information. 2 Based on the average exchange rates in 2014 compared to 2013. To analyze internal premium growth in terms of price and vol- ume, we use four clusters based on 3Q 2014 internal growth over 3Q 2013: Cluster 1: Overall growth – both price and volume effects are positive. Cluster 2: Overall growth – either price or volume effects are positive. Cluster 3: Overall decline – either price or volume effects are negative. Cluster 4: Overall decline – both price and volume effects are negative.